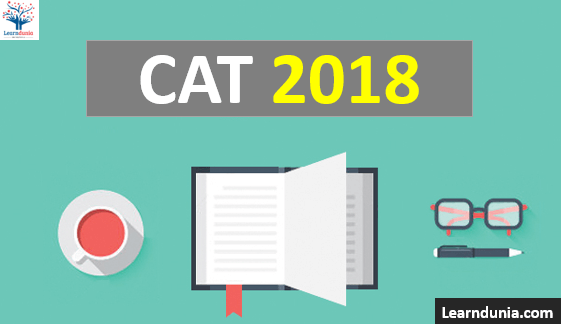 CAT 2018 Result has been released now, Click Here to Check CAT 2018 Result. 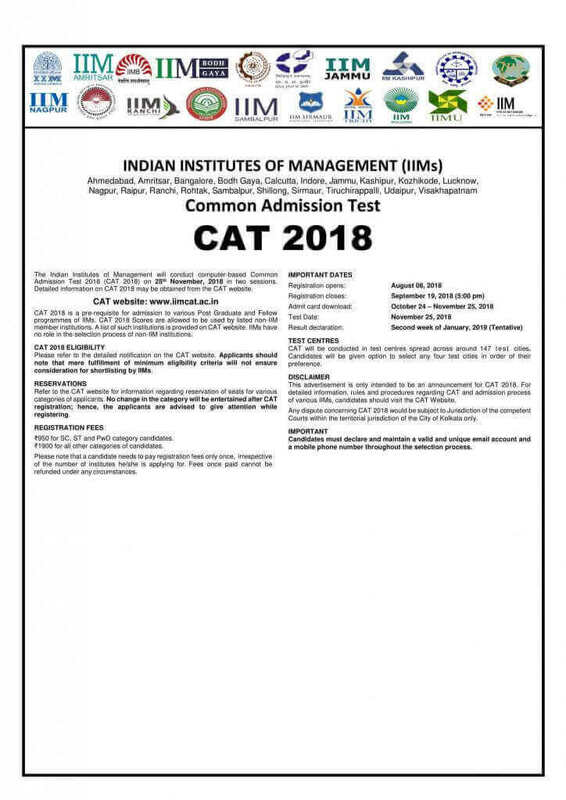 CAT is known as Common admission test which is organised for students through this entrance exam candidates will get admission in post graduate courses which is offered by the top IIMs and Top B Schools. The admission process will be done through the IIMs. CAT is organised every year one of the IIMs on the rotational basis. As there is no decided attempt for appearing in CAT Exam. CAT Application Form will be available on Online Mode only. The Application form will be available from 8th August 2018. Last date of filling the application form is 19th September 2018. Candidates can visit the CAT official website to fill the CAT Application From. Fill the required details carefully such as Personal Details, Educational Details, and other required details. CAT Application from correction facility will be available from 4th week of September 2018. Candidates can pay the Application Fee in the online mode. After filling all the Details and payment take a print out of the Application form and save it for the future use. Visit the official website of CAT (Link will provide soon). Click on “Registration for New User” link. The Application Form will be display on the Screen. Fill all the required details such as Personal Details, Educational Details, Work Experience etc. The format of the picture is in .JPG or .JPEG format only. The Application Fee for SC/ST/PWD candidates is Rs. 950/-. After filling all the information and making the Application form, the authority will send the Confirmation Mail to the Candidates registered E-Mail ID. CAT Application fee will be pay on only Online Mode. Candidates can pay the Application Fee through Credit/Debit Card or by Internet Banking. CAT Application Form Correction is done through online mode, candidates can make a application correction through the official website of CAT. CAT Application Form Correction will be allowed only for limited entries. the Application Correction is done only in online mode, there is no other mode to make a online CAT Application Form Correction. Candidates can edit Application Form any time before submission the Application Fee. After Making the Application Fee candidates will received a confirmation mail from CAT Official. Qualification: Candidates must have a bachelor’s degree in any stream from any recognized college or university. Percentage: For General Category Candidates, must have secured minimum 50 Percentage marks and for SC, ST and OBC candidates must secured 45% marks. 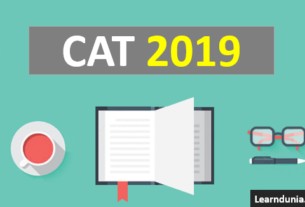 Final Year Candidates: Those Candidates who are in the Last year of there graduation and those who are waiting for the result are eligible for CAT Exam. Others: Professional Degree holder candidates can also apply for CAT 2018 Exam. Age Limit: No age limit for CAT. Marking Scheme: For Each and every correct answer three marks will be given. CAT 2018 Exam Sections: Verbal ability and & Reading comprehensive(VARC), Data Interpretation& Logical Reasoning(DILR); Quantitative Aptitute(QA). Numbers, Number System, LCM and HCF Geometry – Straight Line and Circles being the most important Co-ordinate Geometry Trigonometry Mensuration Percentages Profit, Loss and Discount Interest (Simple and Compound) Speed, Time and Distance Time and Work Averages Ratio and Proportion Linear Equations Quadratic Equations Complex Numbers Logarithm Progressions (Sequences & Series) Inequalities Permutation and Combination Probability Functions Set Theory Mixtures and Allegations. Reading Comprehension, Sentence Correction, Critical Reasoning, Para Jumbles, Vocabulary Based (Synonyms Antonyms), English Usage or Grammar, Para Completion, Fill in the blanks , Cloze Passage, Summarize the given paragraph, Verbal Reasoning, Facts / Inferences / Judgements. Arrangements, Distribution, Games and Tournaments, Selections, Cubes, Logical Sequence, Logical Deduction, Logical DI (Combination of data given in DI representation and a logic based caselet). In Case of any discrepancy in CAT 2018 Admit Card , candidates can contact the examination authority. Once the exam will be conducted successfully by the IIM Calcutta then Answer Key will released after one week of exam via online in the official website. From the answer keys candidates can evaluate their performance in the Examination. The authority gives a facility i.e. objection against the incorrect answer. If any answer they found wrong in the answer keys then they can objection for this. Fill you details like application or roll number & date of birth or password. Select the shift where you have given your examination. Click on the view answer key. PDF will be appeared in front of your computer screen. Download it; check your answer how many question answer’s you have given correctly. IIM Calcutta will released CAT 2018 Result on 2nd to 3rd week of January 2019. Those who appeared for CAT exam can download CAT result from the official website by entering their application number and password in the application form. In CAT result candidates scores are also mentioned which are useful for admission in the IIMs. The CAT result will be available via online mode. Candidates can follow the below given steps to down the scorecard. Click on download scorecard button. fill the required details in the result form. Take a printout of this admit card. It is one of the toughest exam in Management Entrance Test. In cat 2017 from VARC section had 32 questions while DILR section had 32 questions and Quantitative Aptitude had 34 questions respectively asked. The most typical section is Data Interpretation and logical reasoning. As comparing with the 2016 question paper quant section in easier. Those who successfully clear the examination and shortlisted for one of the IIMs and for other participated institutes can go for a Counseling Process. Some IIMs also consider past academic marks and work experience while counseling. Those who shortlisted in Written examination will go for the some other test. Final selection is the base final performance over all the phases. Some new IIMs conduct their own common admission process(CAP). For this they made their own Written Ability Test and Personal Interview rounds. IIMs will be responsible to release the final shortlisted candidates list for the various IIMs. When will release CAT Admit Card? Please send me mail when it will available? CAT Preparation Tips with day by day study plan needed?